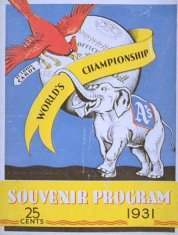 Baseball's relentless dynasty, the Philadelphia Athletics, once again topped the American League on their way to a possible "three-peat" against their previous Series rivals, the St. Louis Cardinals. Once again, the A's had dominated the standings with outstanding play by Al Simmons, who won his second consecutive American League batting title with a .390 average (nine points higher than in 1930) and added twenty-two home runs and one-hundred twenty-eight runs batted in. His equal on the defensive side was Lefty Grove, who won sixteen consecutive decisions and was 79-15 over the last three seasons. Both players continued their pace in Game 1 with Grove throwing a twelve-hit, 6-2 opener that was complimented by a Simmons' two-run blast in the seventh. One standout on the Cardinals side was centerfielder Pepper Martin who had managed three hits off the A's veteran lefthander. After playing seven minor-league seasons and making two small appearances in the majors, Martin had finally been given a shot at the big leagues and he responded with a .300 batting average. Both he and Series veteran "Wild" Bill Hallahan teamed up to even the score with Philadelphia on both sides of the plate. Martin got things rolling in the second, when he doubled, stole third and then scored on a long fly ball. In the seventh, he singled, stole second, advanced to third on a groundout and scored on a squeeze bunt. Hallahan did his part too and held the A's hitless for five innings for a three-hit, 2-0 victory. St. Louis veteran Burleigh Grimes, a seventeen-game winner in the regular season, was given the start for Game 3. His specialty pitch "the spitball" had been outlawed by the league in 1920, but pitchers who were using the technique at the time, were allowed to continue for the remainder of their careers. Grimes, thankful for the league's generosity, had used the wet ball as an advantage for eleven seasons and many younger batters resented the thirty-eight year-old as a result. The pitch served him well as he threw a two-hit, 5-2 masterpiece that put his team ahead two games to one. Down, but far from out, Connie Mack's Athletics were determined to even the score in Game 4. The '30 Series hero, George Earnshaw (a twenty game-winner) returned to the mound for a two-hit, 3-0 triumph that put his team back in the hunt. Hitting had definitely taken a backseat to pitching throughout the Series and both bullpens were filled with talent. It was anyone's game and many fans felt that it would be a matter of who blinked first. Philadelphia's skipper knew that Game 5 called for something special. Mack turned to a thirty-two year-old veteran who he had signed on waivers from the Detroit Tigers in June. Waite Hoyt, who had pitched in six World Series for the New York Yankees and compiled a 6-3 record in the fall classic, was chosen to go up against "Wild" Bill Hallahan. In a shocking turn of events, it was Hoyt who blinked first in a 5-1 loss that featured more extraordinary play by Pepper Martin. Once again the centerfielder had dominated the scorecard with a run-scoring fly in the first, a bunt in the fourth, a two-run homer in the sixth and a run-scoring single in the eighth. After five games, Martin had obtained a .667 batting average (going twelve-for-eighteen at the plate), five runs scored, four doubles, one homer, five runs batted in and five stolen bases. For the first time in three years, the Philadelphia Athletics had found themselves as the underdogs. Fortunately all was not lost as Lefty Grove came up clutch with five-hit, 8-1 victory over rookie Paul Derringer. The A's had once again evened it up at three games apiece, but they were running out of chances. For the final outing, two unlikely heroes stepped up to the plate and made every at bat count. The Card's third-baseman Andy High and right-fielder George Watkins had been having a miserable Series while going for a combined three-for-twenty two. All that changed in Game 7 as they collected all of the Cardinals' hits. After a wild pitch and an error helped St. Louis to two first inning runs, High singled in the third and Watkins followed with a home run that staked pitcher Burleigh Grimes to a 4-0 lead. The master of the "spitball" was strong through eight innings, but needed relief from Hallahan in the ninth. Surprisingly, the last out of the 4-2 triumph, came on a fly ball to Pepper Martin who had left his mark all over the Cardinals second World Series title. Although he had gone hitless in the final two outings, the "minor-league workhorse - turned major league thoroughbred" finished with a .500 batting average. The spitball pitch was banned by Major League Baseball in 1920, but those who were grandfathered in were permitted to continue using it in their arsenal. One of those still pitching who "wet his pill" was Burleigh Grimes ; two (2) starts, two (2) wins, and seven (7) innings of no-hit pitching in Game 3 . 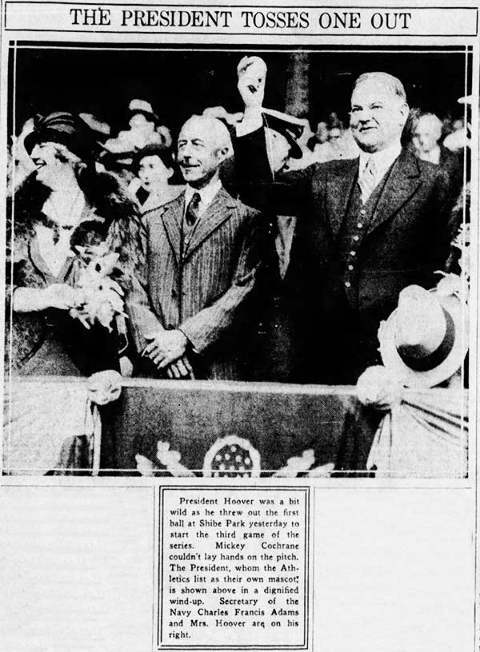 ( 1) The first pitch, during Game 3 , thrown by President Hoover to Cochrane , missed the backstop completely. However, it was successfully intercepted by home plate umpire Albert "Dolly" Stark. Mickey gets the credit for being the intended target, but we believe Stark receives an honorable mention! These same two (2) teams faced off during the 1930 World Series and the Athletics were victorious. The only day-to-day player in the Cardinals' lineup who was different in 1931 was Pepper Martin — a 27-year-old "rookie" who spent seven (7) years in the Minor Leagues and led his team during this series in runs scored, hits, doubles, runs batted in and stolen bases. The 1931 St. Louis Cardinals won a team record 101 games, their first 100 win season in franchise history (a record that stood until 1942), and clinched the pennant on September 16, 1931 - behind the bat of second baseman Frankie Frisch who won the first ever Baseball Writers Association of America Most Valuable Player Award .